Haha, I’m glad everyone ‘enjoyed’ the picture of me and the big Fatboy pillow in the train from the last post! So, as the title of this post reveals, it will make the chocolate lovers among us really happy because it will be something real delicious and simple to make as well for breakfast, lunch or maybe even a midnight snack! Recently when grocery shopping, the Nutella was having a discount (woohoo!) and it’s been a long time since I have a nice Nutella spread on my toast so with not much thinking whether I should buy it or not, this large Nutella jar went straight into my shopping cart. And since Nutella recipes are hot and happening nowadays, I knew I have to step up my game and made something that’s a real a crowd pleaser: hotcake with Nutella! 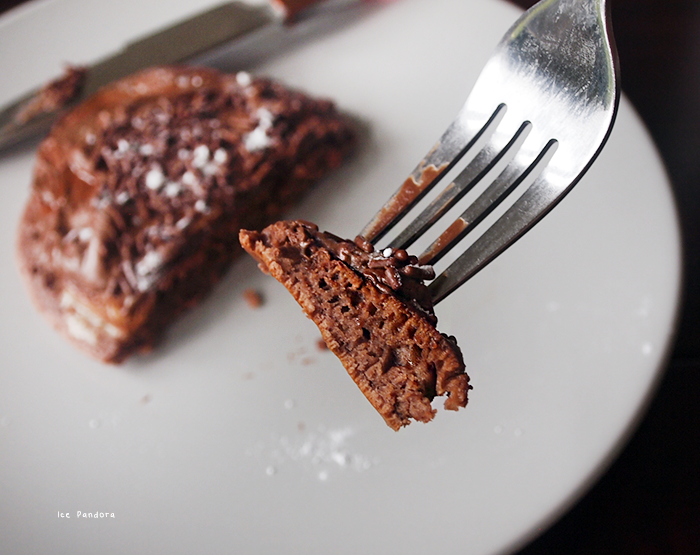 If you like hotcakes/fluffy pancakes (of course you do) and chocolate, then you should totally try to make these! They are YUM! Haha, ik ben blij dat iedereen ‘genoten’ heeft van de foto met mij erop en de grote Fatboy kussen in de trein uit de laatste post! Goed. Zoals de titel van deze post zegt, zullen de chocoladeliefhebbers onder ons heel blij zijn, omdat het iets lekkers en eenvoudig is en om te maken voor ontbijt, lunch of misschien zelfs een late midnight snack! 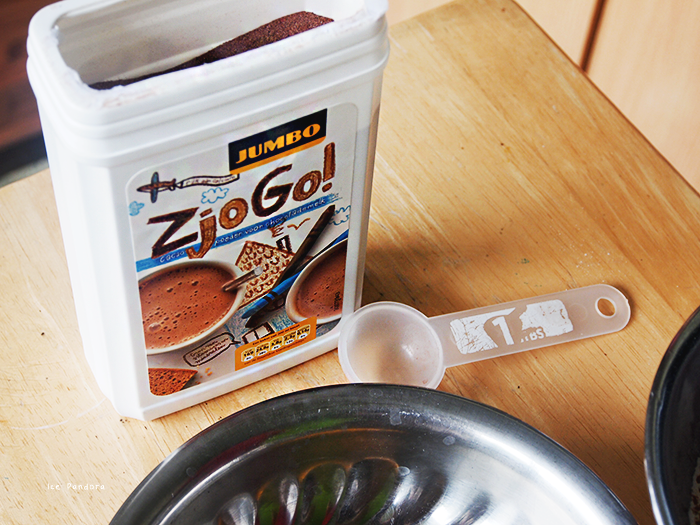 Onlangs toen ik boodschappen ging doen, zag ik dat de Nutella in de aanbieding waren (woohoo!). Voor mij is het best wel een lange tijd geleden dat ik een Nutella smeersel op mijn boterham heb gehad, dus met niet veel na te denken of ik het moest kopen of niet ging deze grote Nutella pot rechtstreeks in mijn winkelmandje. 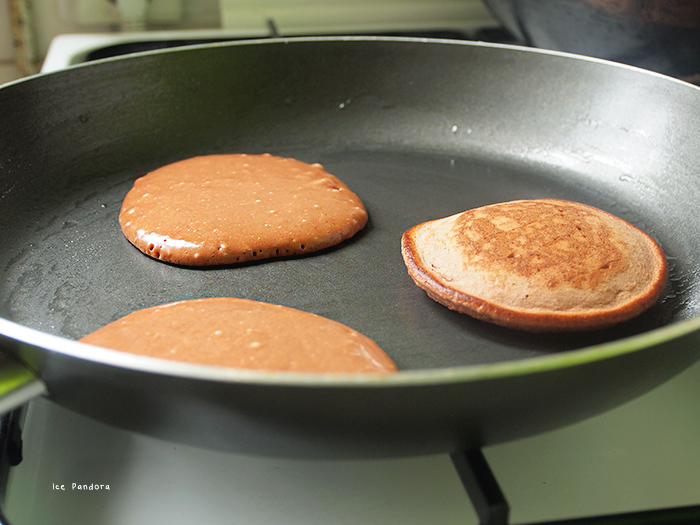 En aangezien Nutella recepten hot en happening zijn, moest ik wel iets speciaals maken dan een doorsnee boterham: hotcake met Nutella! Als je van dikke pannenkoeken (natuurlijk wel!) en chocolade, dan moet je dit helemaal uitproberen want ze zijn YUM! 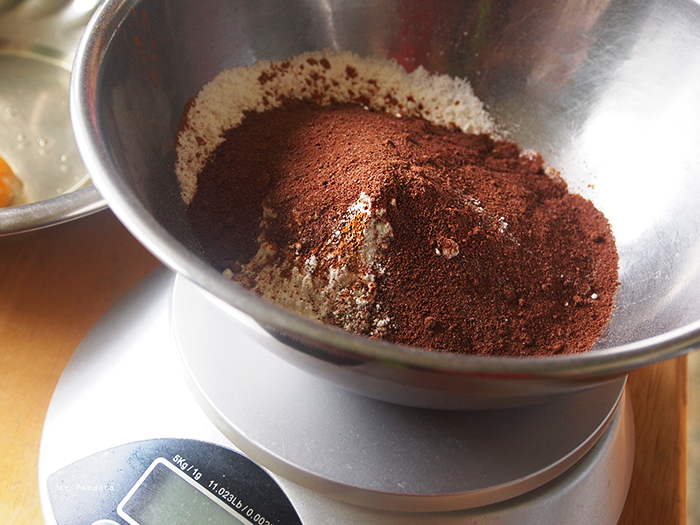 Sift cake flour + baking powder + cacao powder + salt. Beat egg with sugar until creamy. Add in the milk, vanilla extract and oil and combine well! 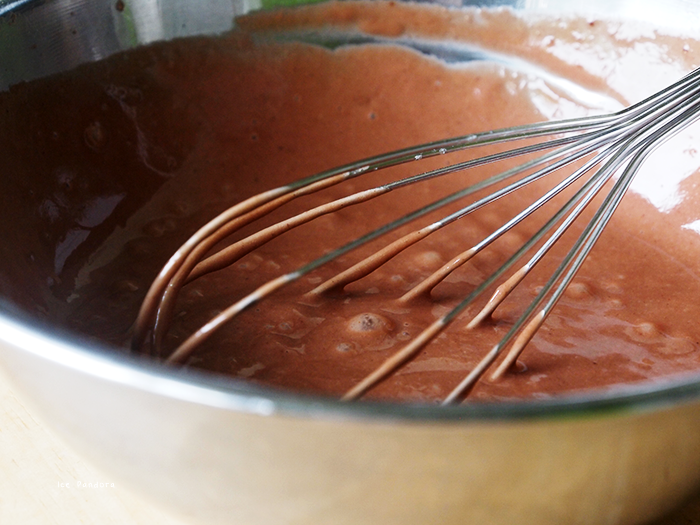 Add the egg mixture into the flour mixture and combine well with a whisk. Heat up a fry pan/skillet with a bit of oil (I run it with a piece of kitchen towel) on a low - medium heat. With a big spoon, spoon the batter in the heated pan and bake for around 2 min. on both sides. 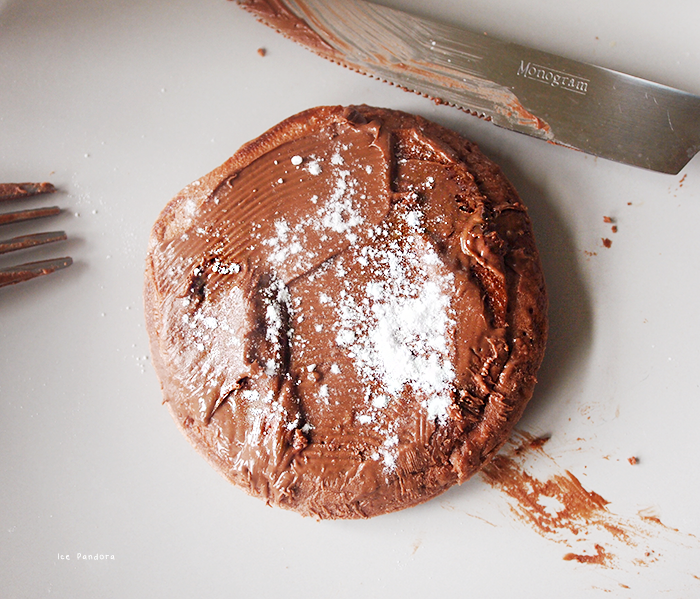 Serve with butter, Nutella and icing sugar! Or fruit like banana's and sprinkles! 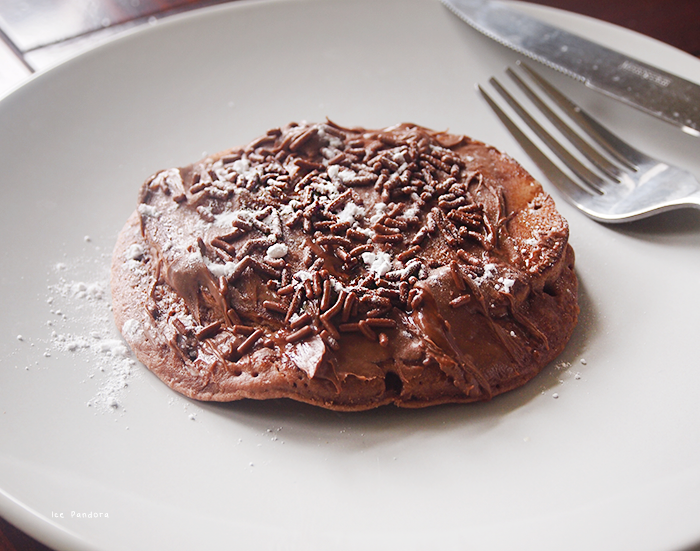 Funnily enough I actually made chocolate pancakes the other day! I didn't have them with Nutella though which reminds me I need to buy some! omgosh this looks so good! i love anything nutella! gotta try this, maybe i'll have breakfast for dinner tonight! !!! Omg I didn't know these types of pancakes were so easy! I can only make the thinner crepe kind. SO trying this in the future!! Damn, these look amazing. I have all these ingredients and will be making them ASAP haha. That looks SOOOOO good wow...I'll definitely have to try it soon! Omg goddelijk! Wat je allemaal niet kan maken met nutella! oh my gosh! chocolate galore! :) i haven't had nutella in a while as well. 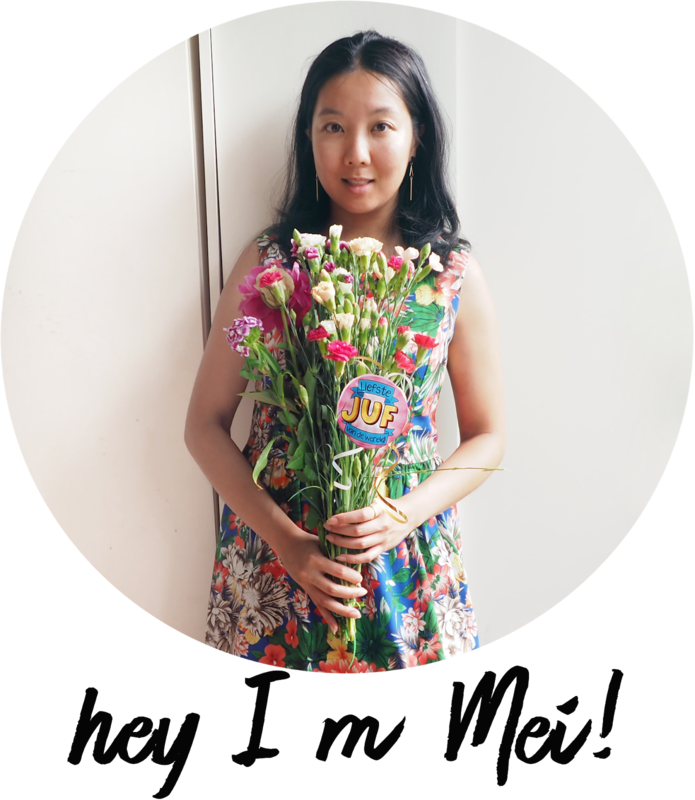 i haven't restocked but perhaps soon. it's always nice to had it as a toast spread and now i know for hotcakes too! OMGAWD...this looks so fluffy and yummy! I love nutella and all pastries chocolate! Oh Mijn God. Dit ziet er echt heeeel lekker uit! My mom used to make us this on Saturday mornings sometimes! they look great! love your video. 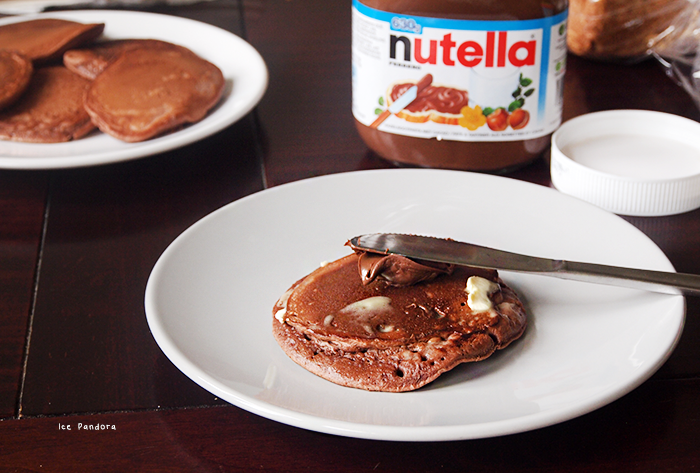 Chocolate pancakes WITH NUTELLA ON TOP?! That's heaven right there. O Gawd... dat ziet er verrukkelijk uit. Om te smullen! Oh man, ik zou zo high worden op een sugarrush. Maar dit ziet er zo goed uit!! !